“Sid Itious” runs a late night radio show in small town America. He is also best mates with a guy he knew since they were both bullied at school, called Kenn (with 2 N’s to be different) Ramsayer, and they are huge fans of music – buying music, categorising it, listening to it, talking about it and going to as many gigs as they can. As they’ve grown up, their lives revolve around music, pizza, beer and an inability to talk to girls. However, this intrepid duo are about to save Rock and Roll and we know it and they’re going to do it in the key of E.
Why E? Because that’s the chord you have to play on Guitar Hero in order to be able to travel through time and get to any gig that you want to, anywhere that you want to go. At least that is what Sid and Kenn discovered. After much experimentation and practise with different soundtrack being loaded on the game, they discover how to control(ish) the gigs that they go to and the music world is their oyster. However, there are evil forces at work. It is no coincidence that they are “crossing”, as they call it, to certain gigs and soon their purpose in life becomes apparent as it falls to them to put something right that went very wrong in the music world in England. I must admit this is a bit of an odd book. The time travelling plot is based on a very clever idea and, in as much as it can be, the science and theories are believable. The author obviously knows, or has well researched, his music too and it is full of factual snippets that fans of certain bands will pick up on. As far as the composition itself goes, I was very taken by the quirk of ending each chapter with the phrase that started the next (just something that tickled me) and the radio inserts at the start of each chapter were a great idea to set the tone of that chapter. I wasn’t too keen, however, on the rambly writing style. Although the comedy in it was amusing, it reads like you’re hearing the story from a group of mates down the pub, which may be fine for some, but doesn’t suit my style of reading. There were a lot of sidetracks and digressions which, in themselves, were interesting but they didn’t seem to fit in with the way the plot was developing and distracted from the main story too much and for too long. It is not as fast paced a book as you would expect for a sci-fi adventure and I feel like the story itself ended two chapters before the book did. I did however enjoy this book. The author has great ideas and he could write fun and adventurous sci-fi short stories or novellas. 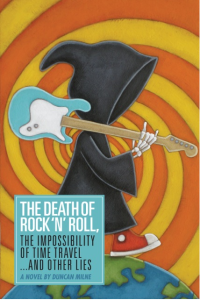 Also his musical knowledge is such that he could write a very good non-fiction book on the history of rock and roll music that I would really enjoy reading. But this book is like the combination of kippers and custard for me, both great things on their own but the two didn’t mix well together.